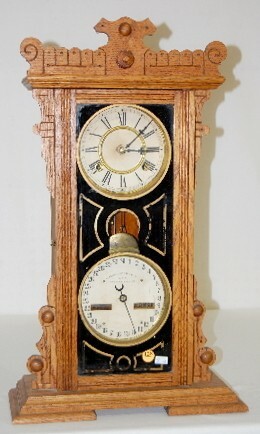 Waterbury Oak "Calendar # 44" Double Dial Clock has pendulum; 8 day; half hour strike; gong; double dial with both dials marked Waterbury; gilt and black paint decorated glass door. (Dial surround on top and bottom are lightly corroded; decoration to door worn in places. Running and gongs. 24"